Introducing, the Printshop/Paper Studio Express Request form! Now you can submit your request/problem/question to the Printshop/Paper Studio using your phone or computer! MCAD's 5000 square foot Printmaking Studio offers classes to students in the various print media. Enjoy the pleasant and spacious atmosphere of the 4th floor Printshop where skylights provide natural lighting. After you've taken a printmaking class, it only takes a few minutes to fill out a Personal Proposal in order to gain access in the future. In the interest of health and safety, The Printshop uses oil based and water based inks, Ferric Chloride for safer etching of copper plates, a rag service, waterbased screenprinting inks, and non-toxic clean up methods. The Printshop conducts ongoing research in an effort to use the safest printmaking processes available. A spray booth system is available for safe exhaust of aerosols and organic vapor solvents. Colored inks, newsprint, rags, and chemistry for printmaking processes are supplied. MCAD's Printshop is open to students currently enrolled in PPB courses or students who have submitted a "Printshop Personal Proposal." The Printshop is open from 8AM-2AM fall and spring semesters. Reminder: Students NOT enrolled in a PPB class must submit a "Printshop Personal Proposal" to the Printshop Coordinator at the beginning of every semester. 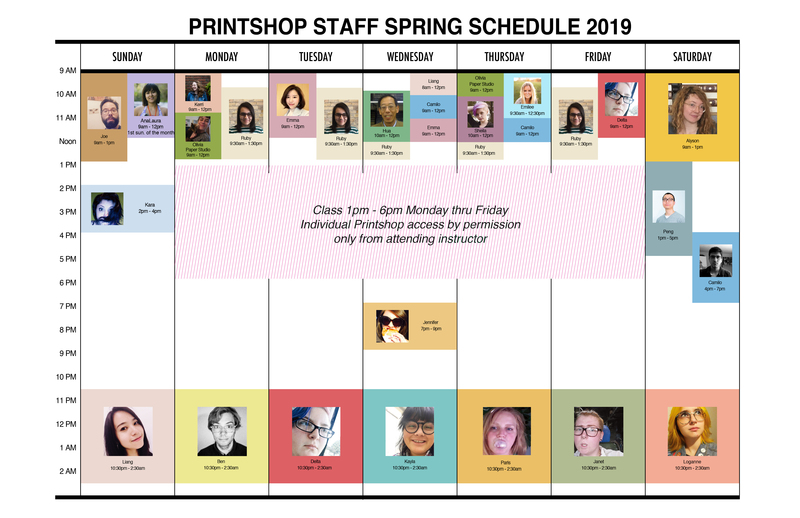 Printshop hours are subject to the availability of qualified monitors, and may be limited during summer session or closed during holiday periods. 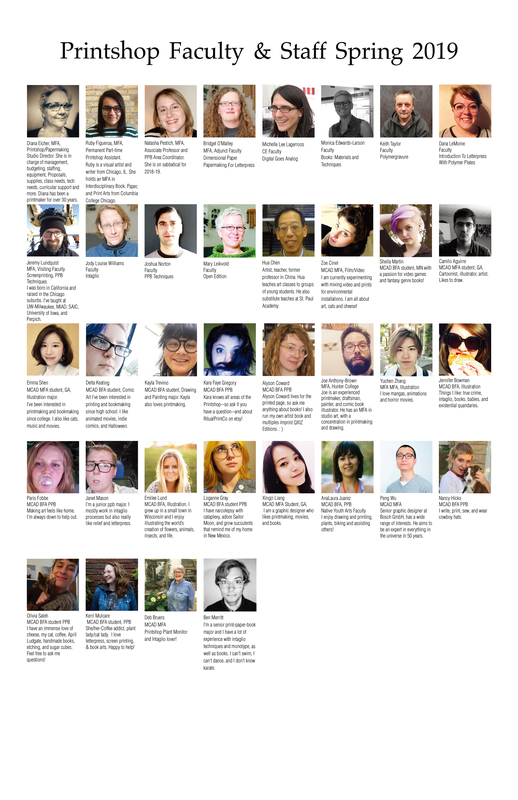 Undergraduate declared PPB Majors as well as current MFA students may petition to have 24-hour access. Contact the Printshop Coordinator to obtain a proposal form or you may download a Late Night Personal Proposal form below. Proposals, Forms, Printshop Rules, Equipment List, Safety Video, etc. found below. Personal Proposals and Late Night Proposals are due each Monday by 10:00 a.m. to the Printshop Coordinator's office, room 415, inside the Printshop, as they are added to the Printshop door by Public Safety on a weekly basis. MCAD Faculty and Staff using the Printshop need to pay a $40 per semester supply fee. The Printshop is closed over break times to all students and there is also no access during break times for Jerome or McKnight Fellows. The Printshop/Paper Studios are open to BFA, BS, and MFA students currently enrolled at MCAD. Continuing Education students who are registered for a class in these areas have access to these studios outside of their class time, provided there are no other classes scheduled. Access is for work that applies directly to classes students are enrolled in. For other uses of the facilities, students must submit a written proposal. There is no access during college breaks. Check with departments for current access hours. Please see the department intranet page for proposal form, and detailed information on access and policy. The Printshop/Paper Studios are open to BFA, BS, and MFA students currently enrolled in a summer classes, with the exception of internships. Continuing Education students who are registered for a class in these areas have access to these studios outside of their class time, provided there are no other classes scheduled. Access is for work that applies directly to classes students are enrolled in. For other uses of the shop, students must submit a written proposal. Students who are pre-registered for fall classes may request access by submitting a proposal. Please see the department intranet page for proposal form, and detailed information on access and policy.